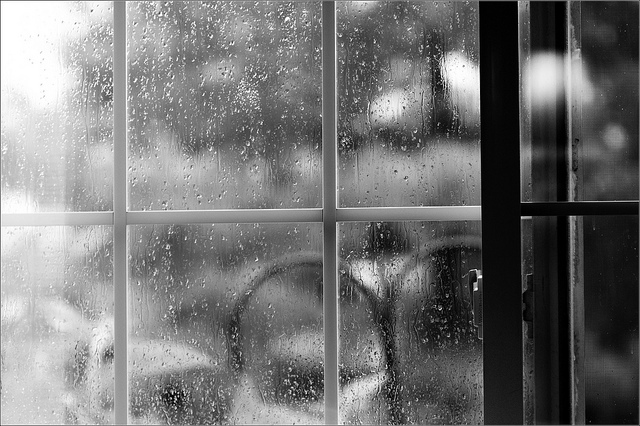 Again she felt the tears spill, running down her cheeks matching the raindrop rivulets on the windows. She shook herself angrily, willing the tears to stop. There was no reason to be so sad, there was so much to be grateful for. That was easy to think, but everything going on in her life just seemed to augment the emptiness inside. Looking out the window all she could see was grey. The winter branches devoid of leaves. The cold sky covered in thick dark clouds. Why was she so dull? Her family was like a kaleidoscope of colour, all living intensely rich lives. She knew because she was the one who made sure that everyone got where they needed to be, at the right time, with all that they needed. Yes her family kept her plenty busy. Perhaps that was the problem though. It was all about them. She was lost. The bright intelligent happy woman had been buried under lack of sleep, the distance between herself and her friends back home, and the need to keep everything together for everyone else. It seemed like such a cliché, needing to find herself. But it had become crucial. She didn’t think she could weather another storm. How though, do you find direction when you’re so lost you don’t even know which way to hold the map? Absolutely. Sadly! I’m more found than lost these days.